Designing your entire home and transforming it into a beautiful abode with its timeless look can be a daunting task. You might come up with a myriad of creative ideas. However, the thing that matters the most is the dream and vision of having your own personalized space. Achieving the perfect look of your entire house involves the consideration of a variety of factors including overall theme, décor, color scheme, and so more. Amongst all of these important factors, the one which people usually tend to forget is the flooring of the house. The best flooring option that offers high design and functionality includes tile flooring. Gone are the times when choosing tiles implied picking from a limited selection of ceramic tiles available in the market. The tile industry has revolutionized itself by introducing a myriad of designer options when it comes to tile flooring for different areas of the house. Maruthi Ceramics offers the best designer tiles in Bangalore. You get to choose the best tile designs from an assortment of stylish and trendiest options. The current tile trend ensures that tiles are not just limited to kitchen and bathroom flooring. The living room is the most vital section of the house. This is the place wherein you welcome your guests and give them a hint about your designer and organized lifestyle. Due to its vital importance, the overall décor of the living room needs to be uptight. While you might give ample attention to the walls, ceilings, and furnishing of the living room, another important aspect to consider is the living room flooring. The modern designing trend calls for tile flooring in the living rooms to accentuate the overall décor. You can consider installing ceramic tiles that offer a natural, yet elegant look. In addition to this, there is the option of going for the carpet tiles as well that come in a series of classic designs and patterns to enrich the look. There are also porcelain tiles for the living room flooring that might give you the real wood feel along with water-resistance and high durability options. You can go for any of these tile types to achieve an overall refined look. For decades, tiles have been an integral part of the kitchen design. However, the latest trend has observed the shifting from the primitive monotonous ceramic tiles to some of the trendiest and high-class kitchen floor tiles. The best feature about the latest kitchen floor tiles is that these are highly cost-effective, highly fashionable, and easy to clean & maintain. Moreover, such kitchen tiles also offer a sense of eco-friendly feel. The modern kitchen tile flooring comes in a myriad of color, design, and texture options that could enhance the overall kitchen look. You can select the best one from Maruthi Ceramics offering a wide assortment of kitchen tile designs and patterns to fit every budget requirement. You thought tiles were only meant for kitchens & bathrooms? The modern homes are observing an exciting display of colorful and pattern-filled tile designs even in the bedrooms of the house. Bedrooms are a great area to play and experiment with tile designing. The bedroom being your personal haven, you can customize the overall design as per your taste & preference. The experts of modern décor recommend that you should not go for a bedroom tile design that appears extra flashy or bright. As your bedroom needs to emanate a sense of comfort and coziness, the tile combination should also complement the same. Opt for shades and colors that impart a relaxing and soothing feel. The natural stone tiles are preferred the best as these bring out the elegant and luxurious feel. Go for a shade that complements your home theme and make use of various layout patterns for proper mixing and matching in your bedroom décor. For the children’s bedroom, you can definitely go for attractive tiling that imparts a sense of fun and liveliness. When it comes to bathroom tile designing, ease of cleaning & maintaining form an important consideration. 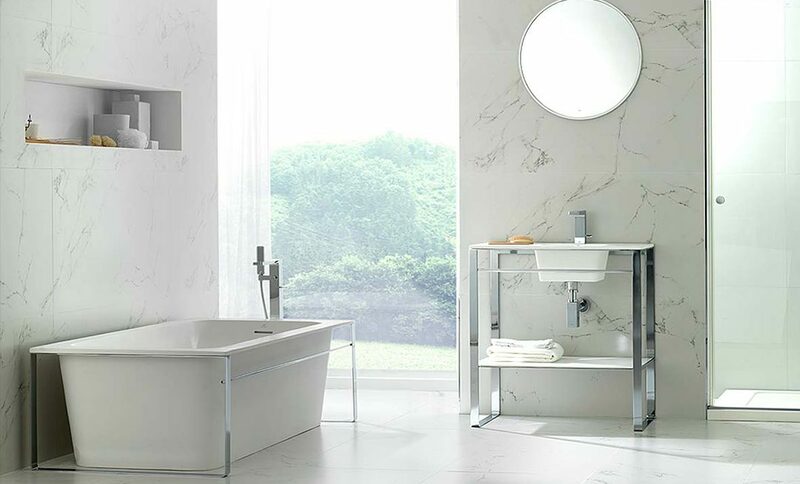 In addition to its overall design, the resistance to water, anti-slippery nature, and resistance to staining of the tiles also need to be paid attention while designing the bathroom décor. There is a myriad of designing and texture options when it comes to selecting the best one for your bathroom. You can make use of floral designs, specific high-style patterns, basic tiles with attractive borders, textured tiles and so more to accentuate the overall look of your bathroom. You can also include some gentle and soft tones in bathroom tile flooring to enhance the romantic appeal. For offering a contemporary look, go for bold tile designs with white solid or bold tiles. Maruthi Ceramics offers an amazing collection of tiles for bathrooms that would fit your home décor perfectly. Go for selecting high-quality tiles that tend to be durable and easy to maintain. This can serve as a long-term investment for your home décor. You can think beyond ceramics as well. From porcelain to cork, wooden texture, and so more could also offer an elegant feel. Hire professional help while installing the floor tiles in your home. A slight installation mistake could cost you additional money. If you are looking for designing your home with exquisite tile designs, then Maruthi Ceramics has the best designer tiles in Bangalore. You can use the most preferred collection of tiles for each area of your house like the bedroom, bathroom, kitchen, living room, and so more to offer your home a royal look. Tiles play an important role in speaking about your personal taste in interior designing. Go for the best one and make your house shine!